There are various reasons why you would want to create a new or multiple user account on your Windows 8 laptop or desktop. You may live in a large household with your family that shares a computer, have a roommate that occasionally uses your laptop or just want to setup a separate account on your computer for Guests. 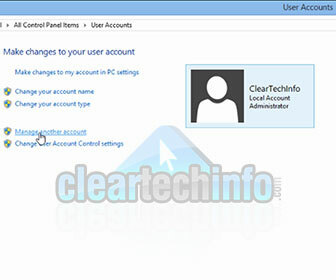 PLEASE NOTE: Only Windows 8 Administrator accounts are allowed to create new user accounts. It does not matter if it is a limited Standard User or an Administrative User account. If you do not have access to login to an Administrator account then you cannot create any new user accounts. [adblockingdetector id=”1″]Whatever the situation is, you do not want anyone to have access to your user account and personal files on your Windows 8 computer. Personally, I don’t want anyone to change any type of Windows settings, delete anything on my user account or even move around the icons on my desktop. This would be very annoying to me. But if you still want to allow people you know access to your Windows 8 computer without giving them access to your personal files or settings, you must create another Windows 8 user account. If you are creating another Windows 8 user account on your laptop or desktop for someone who doesn’t know that much about computers or you may not trust that much, then I highly recommend creating a basic “Standard” account for them. The Standard User account in Windows 8 limits the user to only access preinstalled programs, Internet and files created within the Standard User account. A Standard User cannot install new programs, update Windows, change system settings or view the files of other users. If you want to give someone better access on your Windows 8 desktop or laptop then you need to create Administrator user account. [adblockingdetector id=”5″]Windows 8 Administrator user accounts have full access to your laptops and desktop PCs. You can install new programs, change system settings, view and delete files from other users and overall cause chaos in Windows 8. So create this type of account for people sparingly. Be aware, it is important that you create at least one Administrator account on your Windows 8 computer using a Microsoft email address like @live, @hotmail and @outlook. The reason is that Administrator accounts created using a Microsoft email address have top level access that will allow you to manually update and change settings for Windows Update. I explain a little more about this in the video below. If you have any QUESTIONS or COMMENTS about Windows 8 creation of new Standard or Administrator User account or you just need general help on Windows 8, feel free to ASK FOR HELP BELOW!